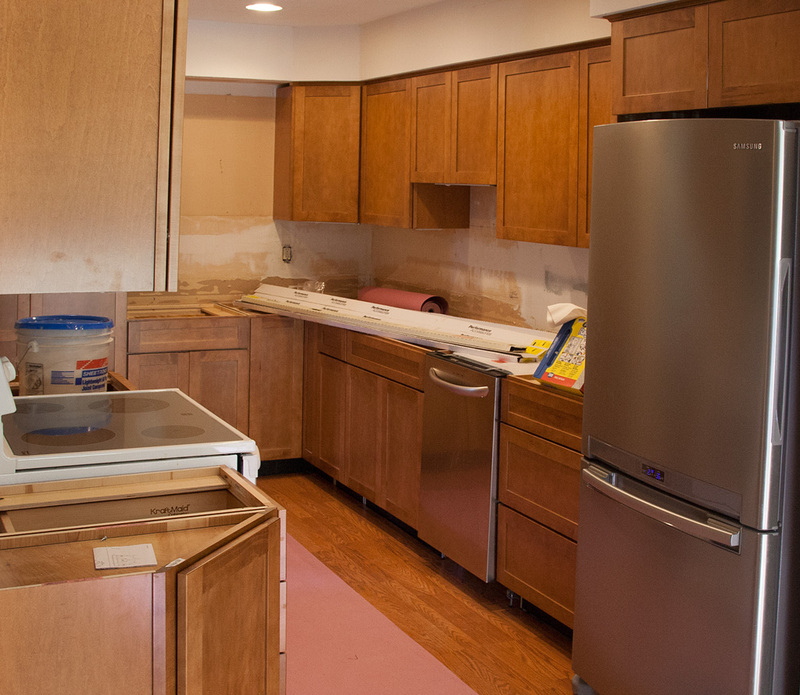 The kitchen as it appeared at the end of a half-day’s effort this Saturday. The crew of A&G Home Improvement came in for an intense half-day this morning. They finished laying the flooring on the main floor, even tearing out the half-bath there. The major kitchen appliances were placed in their alcoves, more to get them out of the way than anything else, and we can now move about in the living room — even sit at our table if we like! Monday and Tuesday will likely see completion of the contractor’s work, at least until the countertop arrives; the stairs will be surfaced with laminate as will the upstairs hallway. I go back to work and the crew will have to deal with She Who Must Be Obeyed. Now I must prepare for a night conducting Public Stargazing at the Observatory so I’ll leave one photo here showing the kitchen as it appeared at Noon today.